Ever have your sink clog? At the worst time ever? Like an hour before your Christmas Eve guests were supposed to come over? And, you can’t use your kitchen sink? That was about 12 years ago for me now. I have never had that happen again. I did some research and started doing some preventative kitchen sink maintenance on a regular basis. All very simple, inexpensive and chemical free! Do not put potato anything down your garbage disposal or down your sink. Even really watered down mashed potatoes. Truly, they thicken up and become a clog that is very difficult to use. Just don’t do it! Do use cold water when grinding food waste. 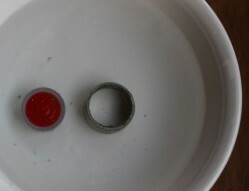 It helps the grease that did get into your garbage disposal solidify and be ground into smaller pieces. Years ago, I was also told it keeps the mechanics of the garbage disposal cool when running. Make sure you never leave food scrapings in your sink or garbage disposal over night. It just gets gross and smelly. Either run it down your food disposal, or remove. Give your sink a good spray with some hot water and then wipe dry. Simple kitchen sink maintenance! Do grind up smaller, softer bones. Like chicken bones. It helps scour the inside of the garbage disposal. It cleans it. Ice cubes are also good for scouring the inside of the garbage disposal. 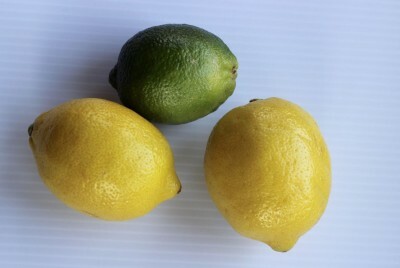 Buy some lemons or limes (or even oranges) when they are on sale. They are the best natural odor preventer for your garbage disposal. Cut into half (or if lemons are large, cut into quarters). Run your cold water for about a minute and then turn on the garbage disposal. Seriously! The lemons and limes help scrub the inside and leave it smelling fresh. I do this weekly at a minimum. I use lemons and limes in my cooking so usually have them handyI know I’ve talked a lot about garbage disposals but this tip works for every single sink. Water weighs 8.34 pounds per gallon. Ever try to move a full aquarium? This is THE most important tip! On a weekly basis, or when you have put things in your garbage disposal or drains that could potentially cause a clog (did you wash some really greasy pans? ), do this. I fill both my sinks to the top with hot water. My sinks each hold over 6 gallons of water. Let me do some math for you – 6 x 8.34 = 50.04. So, you have over 50lbs of water in each sink. That’s 100lbs in total! I then pull the plugs from both sinks and let the water weight/pressure clean out those drains (use tongs or long gloves to pull the plugs so you don’t scald yourself). This tip a handyman gave me, about 15 years ago, is what I credit to the best preventative maintenance to not getting a clog in your kitchen drains. Clean your sink every night. Every single night!! There is nothing nastier than facing a dirty sink with smelly ‘stuff’ in it in the morning. 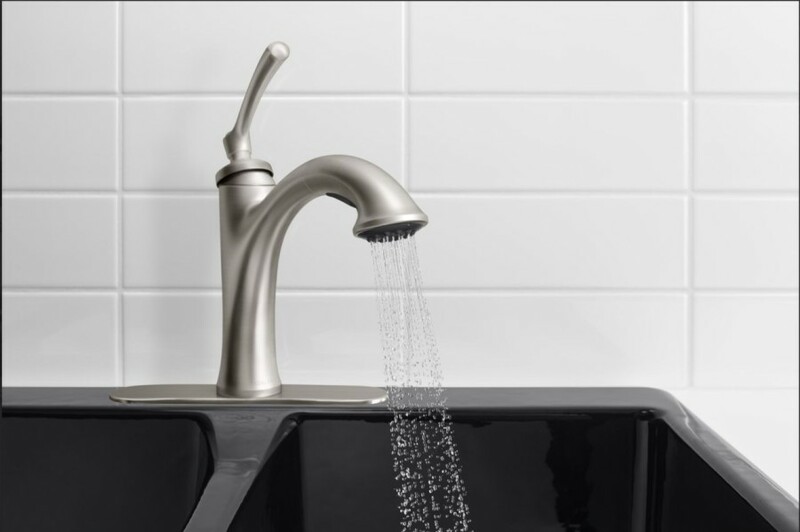 Let me share some information on some faucets that I have my eye on. 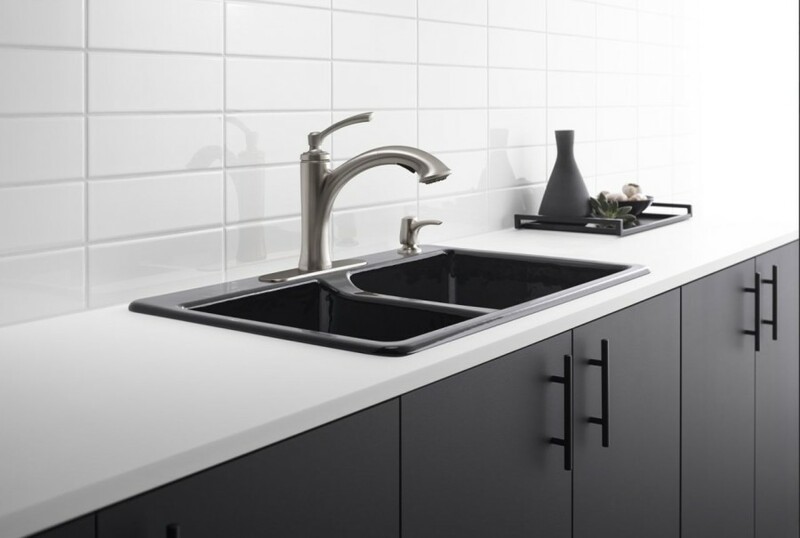 A faucet that looks nice and doesn’t leak is a great thing! This is probably the item you use the most in your kitchen. Sometimes, it’s a good idea to replace your old one so you have a better functioning, more esthetically pleasing faucet! All the pictures above, are either the Cardale faucet or Elliston faucet and both can be purchased at Lowes. 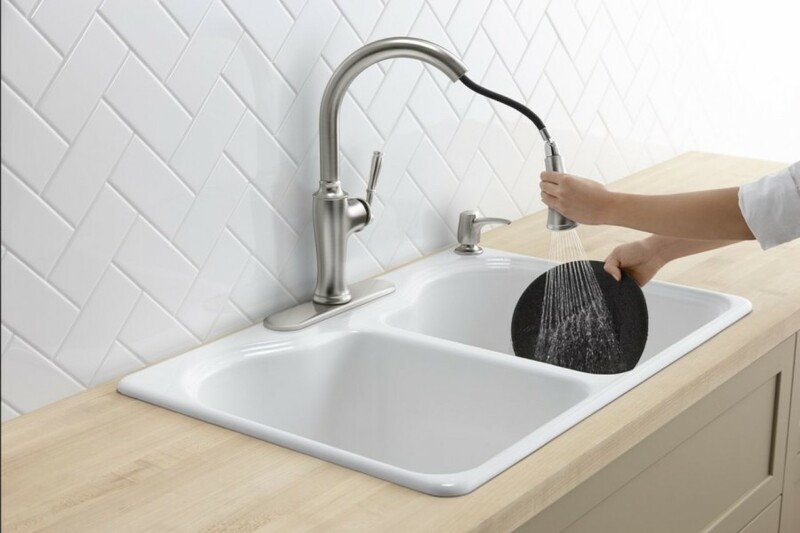 The Cardale faucet has a Sweep Spray (TM) that creates a forceful blade of water designed to sweep away stuck-on food from your dishes. Or those bits that get stuck on your sink. This would be very helpful in cleaning up your dirty sink! Of course there is a spray head to help rinse those dishes and rinse out your sink. Or, to extend when you need to fill a pot of water. Temperature memory is something I would have loved when I had younger kids. I always used water at a hotter temperature than what my kids could tolerate. 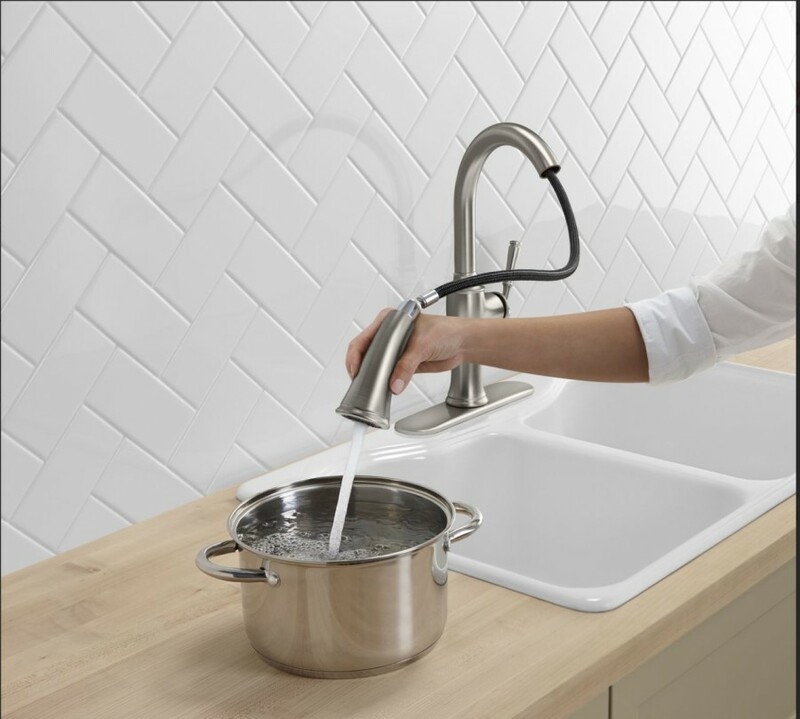 The Cradle faucet allows you to have the faucet to be turned on and off at any temperature setting. Kohler also has a Kohler Scratch Shield (TM) that helps resist corrosion and tarnishing. In other words, it will look good for a long time : ). The Elliston faucet is another faucet to look at if you are thinking of getting a new faucet. It has a sleek and refined design. And, it also has the Kohler Scratch Shield (TM) finish. To keep it looking good for a long time (by resisting corrosion and tarnishing. This one resist mineral buildup. It also has a high temperature limit to prevent that scalding issue I mentioned earlier. I hope everyone has found the above information helpful! Make sure that you follow the chemical free maintenance tips I gave you. 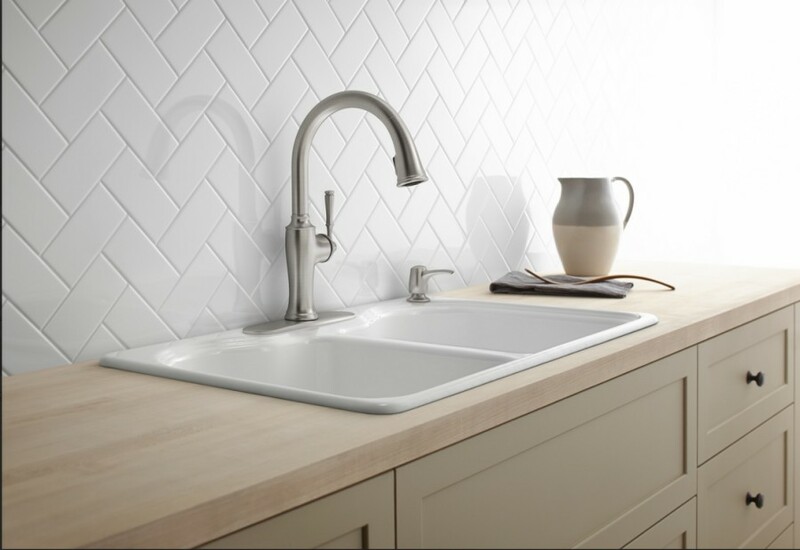 And, if you are looking for a new faucet, make sure you take a look at the KOHLER Elliston and Cardale faucets! It really does help you enjoy being in your kitchen and do your kitchen chores when what you use is attractive and functional! For more information, click the links for the Cardale Kitchen Faucet and the Elliston Kitchen Faucet. « My Black Cat. Why we love him. Easy to follow, thank for this tips. Nice job. I would choose the Cardale because I am always filling up things that don’t fit in my sink. Wow! Such great tips! I never thought about potatoes causing a problem! The sinks are beautiful. I can’t wait to renovate our kitchen. I’ll definitely check them out! Thank you. Wish I had seen it sooner!